It cures CRL UV702 glue in seconds. Edit: Here is A caparison of UV LED's as well. Very cool build. Love how the "pink calcaite" (sp?) reacts. I have one from DX that claims to be 1W 365. I will have to try that glue curing test and see how long it takes. I love going through my room with UV light - you see so many weird stains. If you look closely when I take the UV light away from the calcite you can see a blue phosphorescent afterglow. Any chance of a few photo's of the build? I dont have any I threw this together really fast back in the fall. Its the LZC-00U600 , Its discontinued production wise I believe . Its a UV phlatlight style with 12 of what looks to be the same emitters used in ours. @laserman Will this work faster to cure the glue than a laser made with the 405 nm? Also, how did you put the emitter and driver in? The smaller spring...where did you get it? The CRL UV702 wont cure at all under 405 Not that I am aware of at least. Norland makes some for 405 though. The driver is held in by a retainer ring and the LED is soldered on afterwards once driver is in place and wires are pushed through the holes. Springs are here but they aren't the best. they crush down pretty fast. There's a $14 dollar pair of light yellow sport safety glasses you can buy at walmart that blocks UVA and UVB it even blocks the super bright 9 led rayovac 405 black light they sell ( I can feel that light warm my face and it lights up my room a good bit more then my 50mw 405) might want to get the googles since they don't block other light and even with 405 led's you can see nasty stains better(blocks like 99% of the light) and they're shatter resistant so you can wear them while biking and they even come with a pouch. But that light has hardly any throw yet I can see it 20+ feet away at night and things like blurred like when you shine a defrcoused 405 laser at them. OR... OR just use any pair of polycarbonate safety glasses. Sry I'm late. 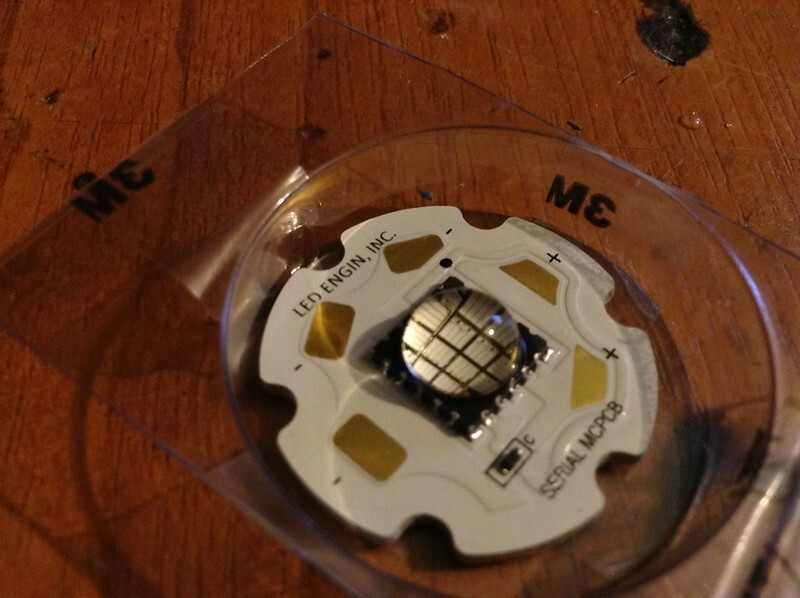 What influenced you to go with the name brand LED when 3W 365nm LED's go for 10X less on ebay?